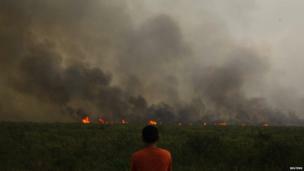 Images from Indonesia's Sumatra island, where forest fires are causing a choking haze to spread across the region. 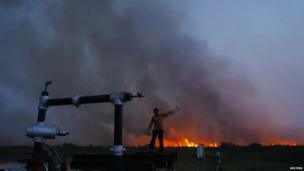 Forest fires in Indonesia's Sumatra island have shrouded parts of Malaysia, Singapore and the island itself in a choking haze. 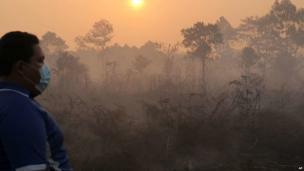 Palm-oil firms are accused of using slash-and-burn agricultural techniques to clear space for plantations. 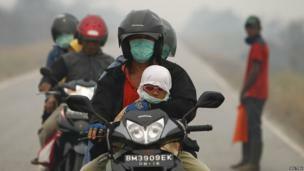 Much of the media's attention has been focused on Singapore, where pollution indexes recorded their worst-ever readings this week, but villagers in Indonesia's Riau province are among the worst hit. 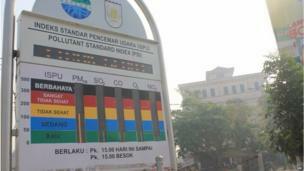 Residents of Riau's provincial capital Pekanbaru are closely watching pollution indicators. 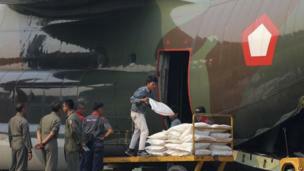 Indonesia has mobilised planes and helicopters to battle the fires, and is attempting to induce rain through cloud seeding. Singapore's authorities say they are considering legal action against two Singapore-based firms allegedly linked to some of the fires. 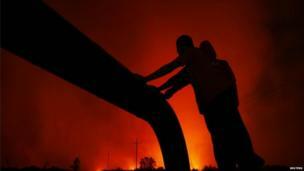 However, the fires and the haze are annual events, and the authorities in Indonesia have shown little inclination to discipline the companies involved.